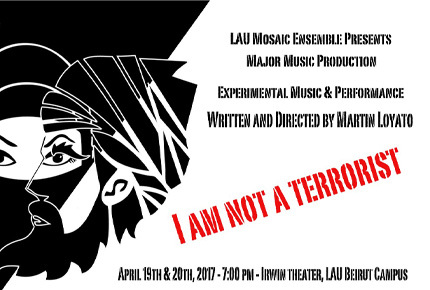 The LAU Mosaic Ensemble presents a major music production entitled “I Am Not A Terrorist”. The performances, to be held on April 19 and 20, will comprise experimental music written and directed by Martin Loyato. “I Am Not a Terrorist” is an experimental performance, in which I intend to arouse thoughts and feelings that might create a constructive awareness of today’s current international sociopolitical situation. One can see how Middle Eastern individuals have been mistreated and misjudged by the West just because they were born in these lands. The topic is not clearly a black and white one. There are important questions that one should be able to ask to oneself and analyze. This does not mean that terrorism should be acceptable, because it is not. The intention of the show is to at least make the audience, throughout an experimental performance, discuss and reflect upon what creates the environment for these sorts of behaviors and the aftermath of the equation, without forgetting the significance of the human being component from the three sides; the West, the Middle East and the terrorist groups. Why do they react that way? Is it due to power, oil, religion, culture, illiteracy, privilege and oppression, or just dominion strategies of fear?